The village of Sevarlije, which lies just beyond the outskirts of Doboj town, is another example of a surprising local post-war success story. In 1997 it was still an abandoned wilderness. Houses had been looted and burned down in 1992. The whole area along the River Bosna, including the primary school, was mined. Weeds and bushes had overgrown gardens, houses and roads after the village was abandoned. In 1992, the villagers living in Sevarlije, and in neighbouring villages, were told by the hard-line Bosnian Serb authorities in Doboj to hand over their weapons. The villagers, as elsewhere in Bosnia, believed, at first, that if they co-operated they might be left alone. "It was the European Football Championship. The final, in which the Danes won. We were watching the game in my room, when we heard the first shot." 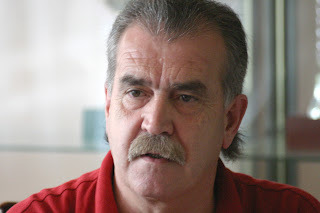 "When those three came, they put us all down here against the wall of the barn and then they told us: ‘Now we are going to kill you all!’"
Sevarlije's former leader, Aziz Ibrakovic, coordinated the return of his fellow citizens to their home village with great determination. He collected applications, which he then handed over to the UNHCR (the UN Refugee Agency) and the Doboj municipality. First, 50 applications for return were registered with the municipality; then came another 50. In the end, there were 400. "I decided on the 1st of June 1998. We were told to make a list of 100 families – but I put in all the 113 that wanted to go first. In the morning we took off. When we reached the heights of our village above the River Bosna, we sat down together and just wept!" For the return to succeed, huge support from foreign donors was essential. Most of Sevarlije's citizens were destitute and had no savings. Many of them made a living off casual labour. Ultimately, the speed of the returns came to depend on the flow of donor aid to support reconstruction. Sevarlije. © 2008 pre tv. All rights reserved. The community kept a list of all returnees. Before the war, the village had some 450 houses. In 1998, the European Commission financed the reconstruction of the first 100 homes; another 289 houses were rebuilt with aid from other donors. Electricity was restored by the local provider with the support of USAID. A further 93 houses were reconstructed by their owners, mostly people who had lived and earned money abroad. By 2007, only 69 houses had not been rebuilt. In most cases, their owners had started a new life in the Federation or abroad. 1,600 people now live again in the village. The first neighbours to help the Bosniak returnees were displaced Serbs living in nearby villages. Until the first grocery store opened in Sevarilje, the returnees bought their daily necessities in a Serb-owned shop in a neighbouring village. Not a single incident has impeded the return. RS police patrolled the village every day. SFOR (NATO forces) was never far away, providing essential reassurance. Sevarlije has seen a return to a normal and intact social life – an astonishing development, considering the scale of destruction and suffering during the war. In the centre of the village stands the well-restored mosque. The community has rebuilt its cultural centre, now equipped with a small kindergarten and rooms for cultural activities. Sevarlije’s women use the community centre for meetings and activities like sewing workshops. The local agricultural association has recently built its own collection centre for milk, cucumbers and other products. The association counts over 200 members and has recently welcomed 18 Serb farmers. Half of the members collect milk every day and sell it to a Serb-owned company dairy in Teslic, in the Republika Srpska (RS); although the milk price in some dairies in the Federation is higher, the villagers place their trust in – and prefer to do business with – this particular company. "We have returned to the countryside, because it represents for the time being the only source of income. Dairy farming does not bring us any prosperity, but it helps us survive." The new primary school in Sevarlije is a branch of the Sveti Sava Primary School in Doboj. All of its 175 pupils are Bosniaks. Five teachers teach in Sevarlije all the time; another ten – five Bosniaks and five Serbs – work at both the Sevarlije and the Doboj schools. The school in Sevarlije uses the Republika Srpska (RS) curriculum, though for 'national' subjects (language, history, and geography) it uses curricula and books from the Federation. In Sevarlije the language spoken at school is Bosnian. Both the Latin and the Cyrillic script are used, since children are supposed to learn both, though Latin prevails in most subjects. Nevertheless, a boy explains: "I don't care if it is Latin or Cyrillic writing." Today it is hard to imagine that this village had been completely razed to the ground in 1992. Sevarlije is not an exception, however. Bosniaks have returned to all the villages in the Doboj region. More than half of the pre-war Bosniak population of Doboj municipality has returned. Mejra Fehric says it is time to move on, despite what happened in 1992 – when a Serb paramilitary soldier forced her from her home. "To say that I hate him – I can't. If the same man who was here would come tomorrow, I could not kill him in cold blood, or even hurt him, because I am not like that. My soul is not like that."